In this article, I will talk about how to write Monte Carlo simulations in CUDA. More specifically, I will explain how to carry it out step-by -step while writing the code for pricing a down-and-out barrier option, as its path dependency will make it a perfect example for us to learn Monte Carlo in CUDA. Also, I will show you how to efficiently generate random numbers with CUDA and how to measure performance with just a few lines of code. First, I will start with a brief theoretical introduction so if you already know how Monte Carlo methods and barrier options work, you can skip the following sections. 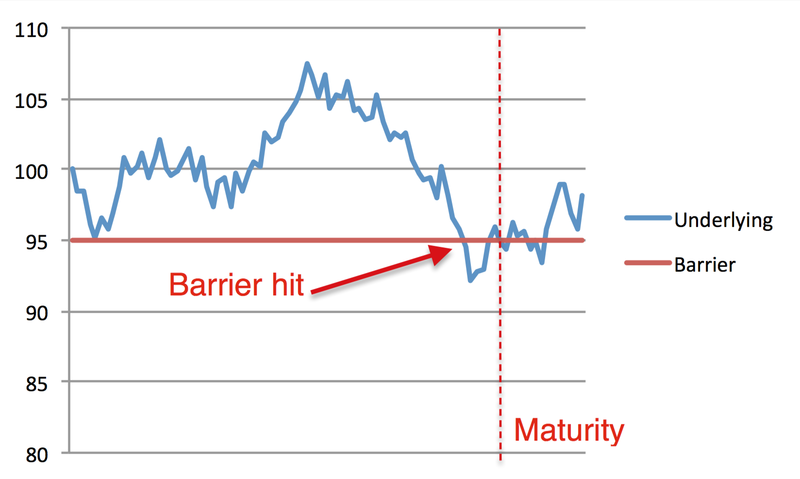 A barrier option is an exotic derivative, part of the set of path-dependent options, whose payoff depends not only on the underlying price at maturity but also on whether the price line hit a pre-determined level. There are different ways to determine this level and how the price can or cannot reach it. The first is the barrier level position in relation to the current underlying price (spot), so we have a first categorization "up" or "down". The second criterion can be "in" or "out", and it refers to what happens when the event "hit the level" is triggered. "In" means that the option starts to be active after having touched the barrier level. "Out" is the opposite, meaning that after triggering the event the option is no longer valid. Also, it could be "paired" with any kind of option. We could have a European option with barrier, as well as an American or an Asian one. Let's consider an example now. The underlying price hits the barrier before the maturity making it invalid. Sometimes, as a kind of insurance, we can have a rebate price, which is a fixed amount of money, usually less than the option value, which we will receive in case our option expires due to hitting the barrier. Of course, this will also change the price of the option itself. where $R$ is the rebate price and $B$ the barrier level. The Monte Carlo method is a well-known method in finance, as it lets us compute difficult, if not impossible, expected values of complex stochastic functions. Mike has already discussed the method in several articles regarding option pricing, but a few recap lines can be helpful for those that are new to it. The Monte Carlo method was first introduced in the field of physics, for complex simulations, very likely by Enrico Fermi in the 1930s for studying neutron diffusion. It then became popular in the 1940s among physicists and mathematicians involved in creating bombs for the U.S. Army. The projects needed a code name, so John Von Neumann chose "Monte Carlo", referring to the famous Monte Carlo Casino. Since then, technology and especially computational power have increased dramatically, letting us use these methods for a large variety of problems. In finance the Monte Carlo method is mainly used for option pricing as, especially with exotic options, the payoff is sometimes too complex, if not impossible, to compute. The main idea behind it is quite simple: simulate the stochastic components in a formula and then average the results, leading to the expected value. Of course, the more simulations (paths) you make, the more accurate the result will be. A commonly accepted value for the minimum number of paths is $10^6$. That should give good results for most of the simulations. Otherwise, there are techniques that can reduce variance in order to make even more accurate predictions. Given the random nature of this process, variance reduction is not the only problem we can encounter. Another one, probably the most important, is how the random numbers are generated. There is an entire branch of mathematics talking about this and a detailed explanation is well beyond the purpose of this article, but we will see that CUDA can provide different efficient methods for generating random numbers by including the useful library curand. As the Monte Carlo method is basically a way to compute expected values by generating random scenarios and then averaging them, it is actually very efficient to parallelise. Moreover, with consumer CPUs on standard computers it is just not possible to reach the accuracy needed, as simulating over one million paths is usually very time consuming. With the GPU we can reduce this problem by parallelising the paths. That is, we can assign each path to a single thread, simulating thousands of them in parallel, with massive savings in computational power and time. At the end of this article I will show you the numerical results, making it quite obvious why it's better to run a Monte Carlo on a GPU. First, let's see what and how to parallelise. 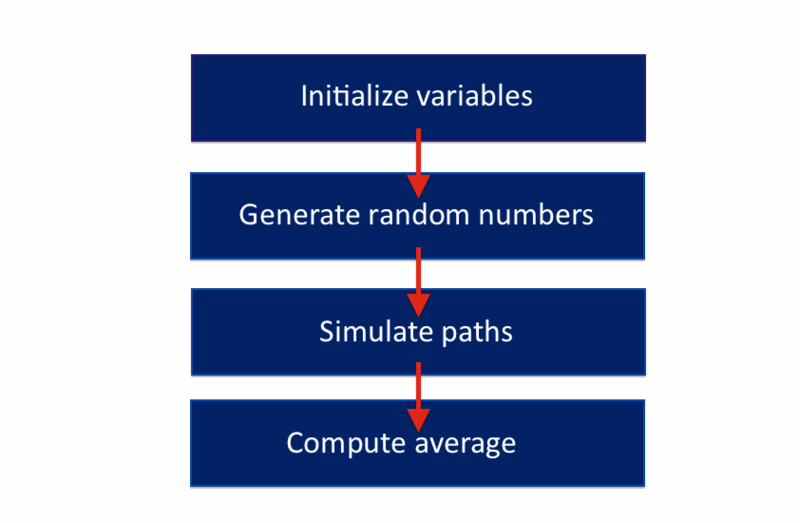 In option pricing, usually the only variable that can assume random values is the underlying, so we only have to write a kernel that can generate a simulated value for the underlying and then calculate the option price. That's it. Sounds easy, but actually we have to cope with a couple of issues that we could have avoided for the pricing of a path-independent option. That is, as the barrier can be hit at any point in time we have to simulate step by step the changes in the underlying price, significantly reducing the code speed. Why? Let's say that we want to run an accurate Monte Carlo, which means more than one million paths. And let's say that we also want to use a reasonable proxy for price changes, i.e. only simulate daily changes. This means that we will have to generate 365*10^6 random numbers as well as perform 365 price computations one million times! Also, for more complex derivatives or for purposes other than learning, daily changes will likely not have sufficient granularity. Before having a look at the code, let me give you the last theoretical basis you need (if you don't know it already) to fully understand this method. For simulating the underlying price, we must discretise the underlying's changes. In this article, I will make use of the Euler method, as it's very easy to understand (and code up) and, despite the fact that it isn't the best method, it's still a good approximation for our needs. $Y$ is the price at the time step $n$, where $Y_0 = S_0$. Now we have to compute the changes. As you can see from the list above, the only random variable is $dW$. This variable is the only reason why we need to run a Monte Carlo simulation. Now we are ready to have a look at the code. You can get the number of clock ticks elapsed since the program started. This is a C function and, as it can be affected by many factors, it's better to never use it alone. Instead you can compute the difference between two times and then get the time (in seconds) of a given task or code portion. This simple code will give you the exact time elapsed for the // routine part of the code. CUDA also provides a library for this purpose, but for now the C one is more than sufficient for us. CUDA provides efficient random number generators for a lot of different distributions via the library curand.h. In this case, as the Brownian motion evolves with normally distributed random steps, we will use the normal generator. This first one is just a variable declaration, in which we are creating the new generator as a variable of type curandGenerator_t, called curandGenerator. Now it's time to finally generate our normally distributed random numbers. We can do this by using the curand function curandGenerateNormal, which takes as inputs the curand generator, the output array (in which we want to store the numbers), the amount of numbers to generate, the mean of the distribution and its standard deviation. In this case, as we are talking about Brownian motion, we will need a normal distribution with mean 0 and variance $dt$. Now let's talk about the main part, looking at the code. At the end of this article you will find the complete code, so now I will explain it step by step. This first part consists of including libraries and variable declaration, but it is useful to notice a few choices I made. First, the try instruction: this is an additional error checking line, as if we have any problem, the program won't crash but will return the error information (using the instruction catch at the end of the code). This is good practice for longer programs and therefore a good habit to develop. Regarding the parameters, you can see that I divided them into different blocks, reflecting their differing nature. In the first one we can find the "dimensional constants", or rather the lengths of our arrays and loops. N_PATHS specifies the number of paths (or runs) that the Monte Carlo method will perform. In this case we have $5.0 \times 10^6$, which is a reasonable number for having a good precision in the estimation. Then, as aforementioned, I decided to compute daily changes, setting N_STEPS = 365. Therefore the number of normals we will need is N_PATHS * N_STEPS, as we will need 365 random changes for $5.0 \times 10^6$ simulations. That is a huge constraint for our precision, as this big array will have to be allocated in the GPU memory. So, we can choose to increase the precision of a single run (by increasing N_STEPS) or the overall accuracy (by increasing N_PATHS), until reaching the size limit for device allocation, which depends solely on your GPU. In this case I decided that 365 was a reasonable approximation, then I maximized N_PATHS, but feel free to experiment, as usually is the best way to learn! The second and the third blocks represent our input parameters. More specifically, the second is for constant declaration, in which constants are "market parameters" necessary for computing the option price, while the third block is for derived variables. The fourth is for array declarations. s is the host array that receives the final prices after they will be computed by the GPU, d_s is exactly the same array but for the device (GPU), and the last one is the array that contains the random numbers. d_s and d_normals are declared using the class dev_array.h that I showed in my previous article. So, if you haven't read it already, it might be worth having a look at it, as it will be used several times for this script. I decided to use 1024 threads per block, even if I didn't notice significant changes in the performance between setting BLOCK_SIZE=1024 and BLOCK_SIZE=256 but, as we will have a lot of threads working (one for each path! ), 1024 is a reasonable choice. So that now we are ready to start with the actual Monte Carlo loop. Second, we have to write a do/while loop. That's a bit different from the usual Monte Carlo methods, which make use of a normal for loop but it reflects the path-dependent nature of the barrier option. In fact if we hit the barrier our down-and-out option will no longer be active, so continuing to simulate that path to maturity wouldn't make sense anymore. You can see here there are two conditions for staying in the loop: the first one is that the number of steps already made is lower than the maximum number of steps (365 in this case) allowed, while the second one is that the current price is still higher than the barrier. We then update the price making use of the Euler discretisation and after that we update our indexes. That is, we first update the normal array index n_idx and then the loop index n, that states which "day" the loop is computing. Using only 365 steps we are missing the cases in which the price fell under the barrier during a certain day and then closed higher than the barrier at the end of the day: this reduces the accuracy of the price but, as I already said, it's part of the trade-off between the accuracy of the expected value and the simulated price path, with your GPU capability acting as your only constraint. Which is exactly the payoff of a plain vanilla call. Now we have to compute the expected value, averaging all the prices that we got from the kernel. First, we need to synchronize the device and to copy the prices from the device to the array. The first is the usual CUDA standard method for synchronizing, while d_s.get() is the dev_array function for copying data from device to host. What follows is the for loop for computing the price sum and, thus, our expected price value. Now we have the price of a down-and-out barrier option in CUDA computed via the Monte Carlo method. Notice that it can also compute a European call just by setting the barrier value to 0.0f! We can see that the GPU implementation was roughly 537x faster than the CPU one, including the memory allocation host to device. In future articles we will also talk about exploiting CUDA using different pricing methods, including multidimensional finite differences methods.